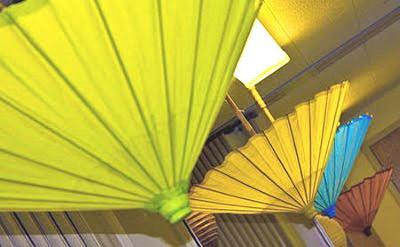 The color scheme of Baby Walter's At the Beach theme baby shower is bright, lime green, chocolate brown, yellow and turquoise blue. These FUN colors taken from the ocean itself are repeated in many of the decorations that were made for the party including a colorful banner and cute invitations. 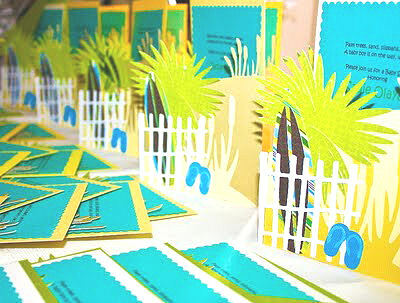 Take a look at these beach shower invitations! The beach theme baby shower invitations are so nicely detailed with many intricate shapes including flip flops, surf boards in the sand and palm trees. I can only imagine the patience and time it took to make these adorable handmade cards! Take your time; the homemade invitations deserve to be OOOOH'd and AAAAAH'd over before we move along to admire the decorations, desserts and the food that was on the menu. Warning, grab something to eat or you will be hungry as a bear by the time you reach the end of this feature story. 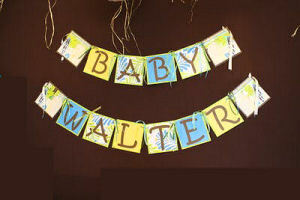 The beach themed banner is made from paper in bright and breezy tropical patterns that can be used to decorate the baby's room or kept as a memento of the party. 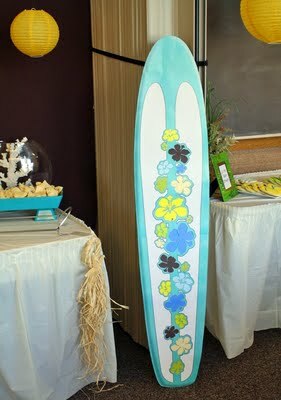 A surfboard draws the guests' attention and invites them to "surf on over" to sample the yummy snacks. The already colorful turquoise blue surfboard's appearance was further enhanced when the hostesses decorated it with tropical, hibiscus flowers made from paper matching the party's colors that they inserted in the cut outs. 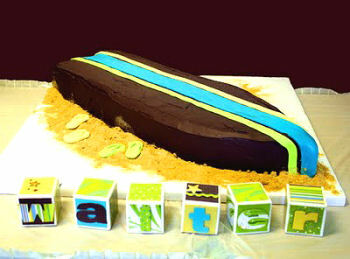 The chocolate beach themed baby shower cake, in the shape of a surfboard, had delicious ganache frosting and buttercream filling. Blocks with letters that spell Walter's name surrounding the pretty dessert will most likely be a welcome addition to the baby's room. And the cake was just the beginning! There was an assortment of desserts that were almost too pretty to eat. 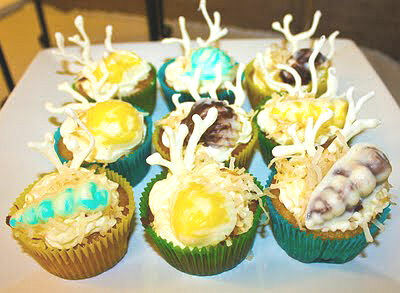 There were beach themed baby shower cupcakes decorated with coral and colorful seashells. 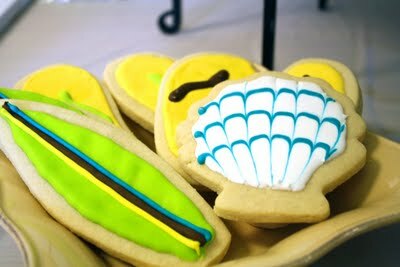 And sugar cookies that (are you sitting down) one of the guys helped to decorate! I love the turquoise blue and lime green of the tableware and napkins! 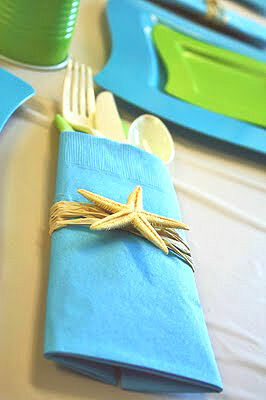 A knife, fork and spoon set for each guest is folded inside a napkin that matched the tableware tied with raffia and embellished with a starfish. Additional starfish and seashells are included in the centerpieces. 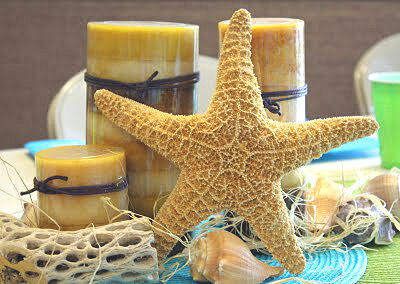 The natural coloring of the starfish and the pillar candles add a calming neutral to the lively color palette. Thanks so much to the ladies over at A Creative Momma blog for allowing us to feature and enjoy their creations. I hope that you have enjoyed taking a peek at their beach baby shower decorations and that you will visit us again soon to see more unique showers and Unique Baby Gear and Nursery Ideas. This is perfect for my shower I'm planning. Would you be willing to provide the the contact info for the person who created the invitations? Thanks! Join in and write your own page! It's easy to do. How? Simply click here to return to BEACH BABY SHOWER IDEAS.